As you tuck into your Easter Eggs, you may not be necessarily thinking about the less worse off in society. But not surprisingly considering the religious nature of the day, in old times many local benefactors were and doles are not unusually associated with the time and a number are recorded in the county. I have already discussed Mary Mallatrat's dole. 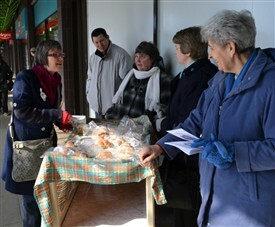 Like this one, many were established on Good Friday, and gave a bread as opposed to hot cross buns as in that charity. For example Mrs Johnson’s dole, Ordsall of one shilling of bread, 14s of small loaves given to Warsop poor, Forster’s Charity at Eakring, which have widows 6d loaves and very poor person a 1d loaf, 30s bread in Lowdham’s Poor Money, Upton’s Tinlay’s Charity gave 4d in six loaves after the service. Some like Edwinstowe’s Christopher Sudbury’s Charity gave money others such as a charity in Welbeck gave 3 shillings and 4 d to Anstey’s poor in a bushel of wheat. In Hucknall, the ‘Widow’s Groat’ was given to 15 poor widows by the minister and churchwardens, from the annual rent of 15s from a piece of land called ‘Crown Piece’. This practice was still continued until at least 1909. Sometimes Easter was the start of a whole season of giving. Fellinham’s and Spofforth’s Charity at Southwell gave £100 and £50 respectively to provide bread for the poor from Easter to Christmas. Being a religious day of observance it is not surprising that sermons were endowed at this time. This would not be an unusual custom pre-Reformation as local families would give money for providing mass at Easter. Post Reformation the custom would have moved to providing money for sermons. Some had specific themes. Records show that Alderman Parker left in 1603, 20s for a sermon on the day at St. Mary’s Church Nottingham to cover ‘Christian love and charity’. Others were functional Tuxford, an endowment in 1756 for the administration of the sacrament is also recorded. The Newark Earl of Scarsdale Charity of 1679 provided money for a sermon on this day, although the details are not recorded of its nature. This page was added by R B Parish on 22/04/2014. In a diary written by a William Moss of Mansfield (who worked as a Cooper) is the following entry for 9 April 1841: "Good Friday. A beautiful day. Hot cross buns for breakfast as usual..."